Just 12 months previously, A P McCoy had ridden Don’t Push It to win the 2010 Grand National and he was installed as joint 2nd favourite on the same horse alongside Silver By Nature ridden by Northern Irishman Peter Buchanan, both backed into 9-1. The most popular money however was on Ruby Walsh on The Midnight Club who was fancied as the 15-2 favourite. Sunshine graced the start of the 2011 John Smith’s Grand National Grade 3 Handicap and by the 3rd fence, it was Ballabriggs making the running from Hello Bud, who came close in last year’s race. There had only been a few casualties by this point, with outsiders Becauseicouldntsee, Vic Venturi and That’s Rhythm the unfortunate trio. The leaders fared well over both Becher’s and Foinavon, but that wasn’t the case for everyone as the field reduced further with West End Rocker, The Tother One, Dooney’s Gate and Barry Geraghty on Or Noir de Somoza all falling foul. Santa’s Son had made his way through the melee to reach the front, guided by the brave Jamie Moore who had once been told he wouldn’t walk again after fracturing two vertebrae in a fall in 2004. Puppy Power had also joined the leaders on Killyglen and Hello Bud was tucked in behind. The entire field had become quite closely bunched with the lead changing hands several times and Santa’s Son was still leading after clearing the Chair. However, this was short lived, as a strong looking Ballabriggs strode into the lead over the water and so it remained, with fence 20 being omitted from the race due to an obstruction. 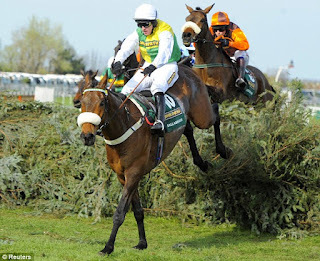 Becher’s was also omitted just two fences later for the same reason meaning the race had experienced the first and second time it had ever happened. Ballabriggs almost came a cropper over Valentine’s, but MacGuire somehow managed to hold on and held onto the lead, being pressed by Harry Skelton on Niche Market. How fortunate that was, as it was an advantage Ballabriggs would not relinquish again. Despite being tested through the elbow by Sam Waley-Cohen on Oscar Time, Jason MacGuire claimed the £535,135 prize money for Trevor Hemmings and the accolades for himself. It had been a hot day in more than one sense and the extreme temperatures meant that Ballabriggs was too dehydrated to take his lap of honour, marking the first time a jockey had ever entered the winner’s enclosure without his champion horse.